7788 - Wavy Throw and Dropped Stitch Throw using Sylvan Leaflet with designs for a Wavy Throw and Dropped Stitch Throw using Sirdar Sylvan Chunky. 7489 - Womens Sweater using Sylvan Leaflet with designs for Womens Sweater using Sirdar Sylvan Chunky. 7488 - Womens Cardigan using Sylvan Leaflet with designs for Womens Cardigan using Sirdar Sylvan Chunky. 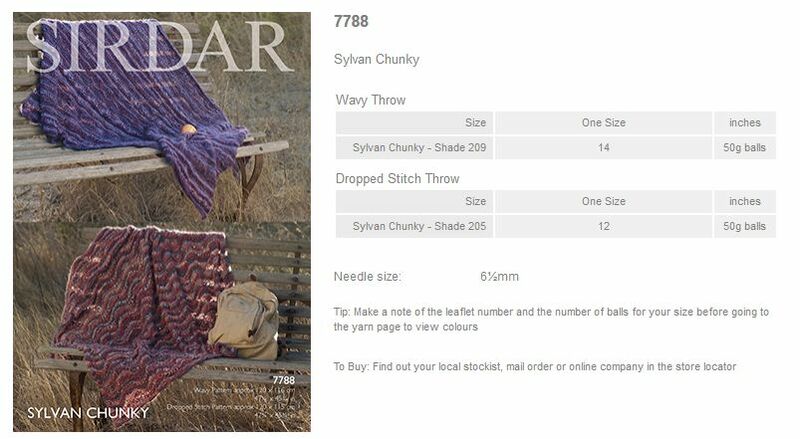 7486 - Womens Long Cardigan using Sylvan Leaflet with designs for Womens Long Cardigan using Sirdar Sylvan Chunky. 7485 - Men and Womens Scarf and Hat using Sylvan Leaflet with designs for Men and Womens Scarf and Hat using Sirdar Sylvan Chunky. 7483 - Mens Cardigan using Sylvan Leaflet with designs for a Mens Cardigan using Sirdar Sylvan Chunky. 7482 - Mens Sweater using Sylvan Leaflet with designs for a Mens Sweater using Sirdar Sylvan Chunky.